1. A woman who rules a family, clan, or tribe. 2. A woman who dominates a group or an activity. 3. A highly respected woman who is a mother. On Wednesday, March 27, 2013 my loving Bride Mary lost her Mom. With the Easter Holiday upon us I hope that Mary's Mom is now reunited with her Husband Dan (Pop) and all the Brennan and Lemon family who have gone before them. Mom, you will be missed but never forgotten. I was lucky enough to say I had a second Mom, who always treated me like her own son. I will miss your giving spirit, sense of humor and matter of fact honesty. I hope I carry forward the things you and Pop taught me since joining your family. Early on when I joined Mary's family we had all gathered for a meal. Cemetery plots and arrangements came up at some point in the many conversations and Mom lets us all know she had written her own Obit as well as Pop had done his. Of course me being the open mouth insert foot kind of guy, I made the following comment, that everyone else thought but didn't speak. I said Mom you only wrote that so you would have the last word.....silence surrounded the table......Mom busted up laughing, she liked that. Mom also like flying with us and made a few trips, Salisbury Wine Festival and the Lima Bean Festival in Cape May, NJ. When we flew to Salisbury she got out of the plane and hugged me. She said; "Honey, I don't want to hurt your feelings but that was boring". I said uneventful was good, she gave that some thought, smiled and nodded with approval. Mary Brennan Lemon, age 86, died Wednesday, March 27, 2013. Mary was preceded in death by her beloved husband Daniel A. Lemon in 2011; parents, Michael and Margaret Brennan; and brothers, Alfred E. and Leo F. Brennan. She is survived by her son, Mark D. Lemon and his wife Madelynn; her daughter, Mary Mascelli and her husband Gary; grandgirls, Amy and Laura Lemon; beloved brother and sister-in-law, James P. and Letitia Brennan. Also surviving are the caring Brennan nieces, Amy, Kate, Maureen, Derry, and Shelagh. Friends and family are invited to call from 4:30-6:30 pm on Monday, April 1st at the McCRERY & HARRA Funeral Home, 3924 Concord Pike, Wilmington, DE 19803. A memorial service will take place at 6:30 pm. Interment will take place privately at the Delaware Veterans Cemetery where Mary will be buried with Daniel. In lieu of flowers, donations may be made in Mary's name to the Salvation Army, 400 N. Shipley St., Wilmington, DE 19801 or Delaware Humane Society, 701 A St., Wilmington, DE 19801. "That's all folks. Hope to see you later." I decided to take to the air today and clear my head along with getting 08Romeo in for an oil change. I sent Vince a text and he joined me this morning for the quick hop to 58M. A quick climb to 1800' then a slow descent to pattern altitude 1000'. My radio calls mirrored my flight path as I made my way into runway three one crossing midfield north east to south west for the left down wind. On the ground with an ok landing we taxied in and shut down in front of Cecil Aero. 08Romeo had plenty of attention as Frank along with Vince worked on getting the oil changed. I forgot to take a sample container with me so I'll wait until next change for that to be saved and sent. Seven fresh quarts of golden honey and one in the baggage compartment, a new filter and leak test complete. We buttoned up 08Romeo and I settled up the bill. The wind had picked up and it was bumpy on the way home, all of twelve minutes. A real nice landing and taxi back to the tie down. Looking in the supplemental flight log I keep in the plane I note that I have added two quarts in 50 hours, that's not bad at all. I have an interior guy coming out to repair my headliner that has started to bubble. I want that fixed asap so my plane will still look good. Also getting scheduled is the annual wash wax by the FBO. 08Romeo always looks like she has fresh paint when they get done. So, when we're not flying to/from, or soaking up the sun on the the beach in Ocean City ﻿﻿MD., we will now be out on the links. Mary and I have decided that we will take up golf. I shot a few rounds maybe thirty plus years ago so I'm as green or rusty as they come. Mary hasn't held a club in her hand, ever. What a pair of crazy folks we are! 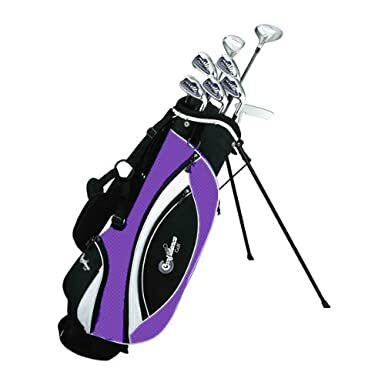 We purchased a starter set of clubs for each of us averaging $130, including the bag. It will be a fun time together, as long as I curb the competitor in me, as we learn the game and enjoy the exercise together. This is a strange post but it was something I wanted to share with the folks who frequent my blog. I guess it's aviation related, but more about life in general and the path we travel each day. With that pre-flight info complete I'll move on to the story. Mary and I had plans to do some house cleaning today. Just to set the stage, I haven't missed a sick day for me since my hip replacement in 2009. Fast forward this week and I was flat out for two days this week with a hacky cough, sinus infection and that got hit by a truck feeling. I awoke this morning at my normal 5 am and took care of Maggie then figured on getting a head start on my chores. I checked in on my lovely Bride around 8am and she informed me that she had what I had and was a no-go for cleaning. Hmmm, not liking that but I can knock it out. I made sure she was comfy and had something cold to drink then headed downstairs to attack the house. Vacuum cleaner, check. Vacuum cleaner bags, zip, none nadda. Ok I'm out the door and off to the store. I figure I'll pick up my Brides prescriptions enroute and make one big haul. Best laid plans and all that stuff. This is where the timing fits in. I'm headed off to the local grocery store for a few items and type c vacuum bags, with a slight detour to get my SUV washed. Ok, back on track and walking down the isles for a small order ($126) and back out to the SUV. Can you tell where this is going? As I head towards the house I remembered the bags and that I did not pick any up...Crap! I detour to the local farmers market thinking it's early they might be open and the parking lot will be empty. Well it was empty, got a front row parking spot and hustled in only to find the the vacuum store closed up tighter than dicks hat band. Plan B, a good pilot always has a plan B, or in this case a plan C. I travel a short distance on the back road where the market is located out to the main highway. I figured why not get the truck washed while I'm out here tooling around like a lost comm victim. I swipe the card for a $7 fee and my ML320 is all clean and shiny, Gary is a happy camper. I still haven't found vacuum bags so I point south and cross back into Delaware from Pennsylvania and head to the local mall, I despise malls. Off to sears, one of the anchor stores and again a front row spot, clean living I guess. Doors opened at 9am so I am in the store and headed to the second floor. I see a man with a back pack vacuum cleaning, very cool and easy to handle. I best not stop, I can't find bags for our canister let alone some contraption like that. A cool toy none the less. This is the part of the story that makes my day. An older gentleman asks if I need some help. I respond, yes sir, since it seems they moved the department that had all the vac's and now sits the bedding department. Yes he said, always changes, follow me. I said you can just get me close and I'll make my way as he moved slowly with a cane. No problem he replied as we walked a few isles together and pointed to the bags, asking what type I was looking for. Type C sir, and there sat every bag one could ever need. I had my AOPA pilots hat on and the man asked if I was a pilot. Why, yes I am, thanks for asking. He stood upright lifting the cane from the floor and said I flew in Korea and Vietnam. I switched bags from my right hand to the left and extended my hand to shake his while I thanked him for his service. I asked, if you don't mind me asking what did you fly? He said the L-19, I said a birddog? He smiled yes, you know of the plane? Yes sir, I sure do. The Cessna L-19A/OE-1 Bird Dog was a four-seat, single-engine liaison and observation aircraft used by the US Army, Marine Corps, and Air Force, the ROK Air Force, and the British Royal Air Force during the Korean War. In June 1950 the US Army awarded a contract for the L-19A, a military version of the Cessna Model 305A, which was based on the highly successful Cessna Model 170 that was first produced in 1948. The first L-19As were delivered to the Army in December 1950. Production of the L-19A continued until October 1954 with a total of 2,486 being delivered to the US Army and Marines. The 60 Marine Corps aircraft were designated OE-1s. Cessna Bird Dogs arrived in Korea on 16 February 1951 and were used in during the last two and a half years of the war for artillery observation and utility and liaison work, replacing most of the L-4s and L-5s previously in use. US Army L-19s served with various divisional headquarters companies and divisional artillery headquarters batteries. The Marine Corps Observation Squadron 6, VMO-6, began using OE-1s in May 1951. Six L-19As were delivered to the ROK Air Force, which flew them from April 1951 through January 1953. The Bird Dog proved so popular with some British pilots that the RAF No. 1913 Light Liaison Flight acquired one through unofficial channels to supplement its Auster AOP 6s. The L-19A proved to be so successful that additional versions were produced after the war. The US Air Force procured many additional Bird Dogs, which were re-designated the O-1 in 1962, and considerable numbers were used during the Vietnam War for forward air control. The man went on to tell me of some of his missions and the day he got shot down. He had spotted a convoy and marked the lead vehicle. When he radioed for a strike he took a round through the bottom of the plane into his right leg and through the top of his plane. His rudder cables were severed and he explained how he managed to cross lines to a safe area and ditched in a rice paddy. I said it took some steel to fly those birds with no protection or fire power. He said we had smoke canisters,marking rockets and our .45's. We chatted for a while as he told me he also flew Bell 47's while in Korea. As if Korea was not enough this man also flew the O-1 the redesignated L-19's that he flew in Korea but now in Vietnam. Maybe there was a reason for me to forget the vacuum bags this morning and maybe, just maybe all the other side trips happened just so I could meet this man at that given time in Sears. Who knows? I'm glad it all worked out the way it did and I enjoyed some history he was kind enough to share. The man was nice enough to ask about my plane and where I keep it, how much flying I do and some of my destinations. I'll have to wander through that department again soon and say hello. 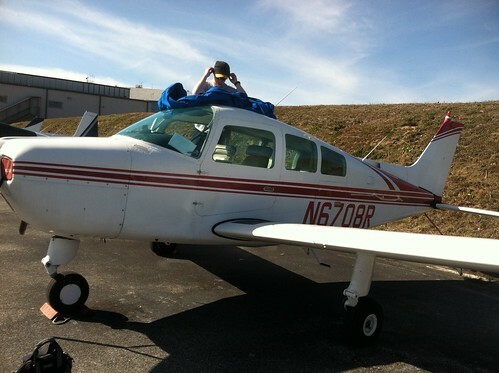 So today I flew with some students from the A&P school up to KFXE. 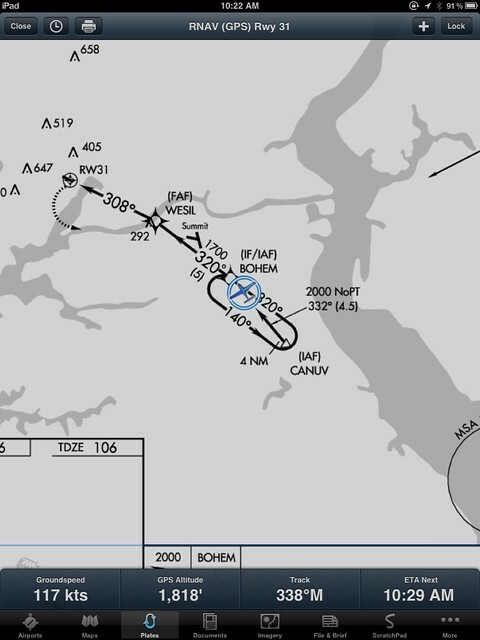 When we got near, I hit direct on the 430 and activated the RNAV approach by vectors. I assumed I would be getting vectors. Called approach and asked for the practice approach. Got vectors. 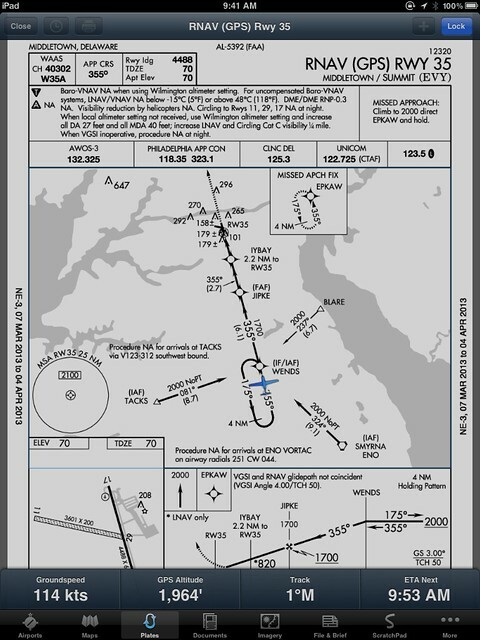 Right before intercept, they asked if I wanted the full approach (with HILPT I assume) or (forgot how this was worded exactly) just the inbound approach. Chose the second option. Was told proceed direct the IAF and cleared for the approach. 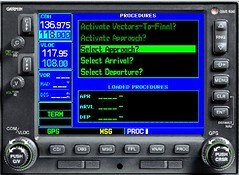 Except the Garmin did not have the IAF because I had selected vectors, not the IAF. I did not know where I was in reference to the IAF. Quickly reloaded the approach with the IAF and everything went fine. How should I have handled this to avoid having to juggle the GPS at the last moment (not to mention the loss of SA). Do you always load the full approach, even when being vectored? In this scenario he 'assumned' he would get vectors, in my flight I did receive vectors. Let's break this down a bit more. I was IMC cleared on the GPS 19 approach into Wilmington, everything was set up and I was fat dumb and happy making my way home. I had selected 'vectors to final' and activated the approach. I was comfortable knowing I would be turned to intercept somewhere just outside of CUBBE, the final approach fix. With my WIRE and GUMPS mnemonic completed I'm enjoying the ride. 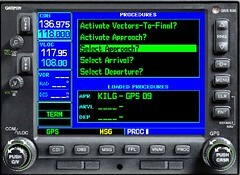 Philly ATC contacts me and gives me proceed direct JIGUP....who? where? 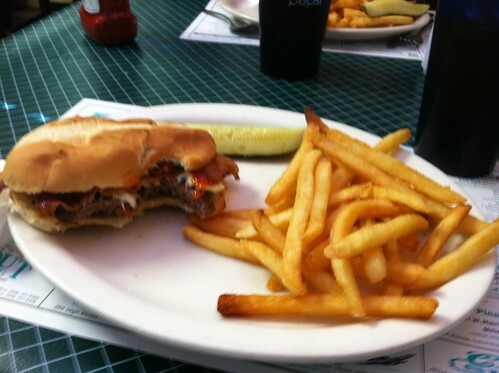 I quickly glance at the plate and confirm the IAF and turn to an approximate course. 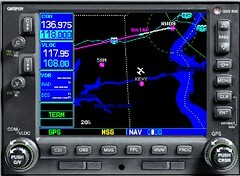 I bug my heading and then go to the 530 and chug and plug the GPS 19 approach and select JIGUP. 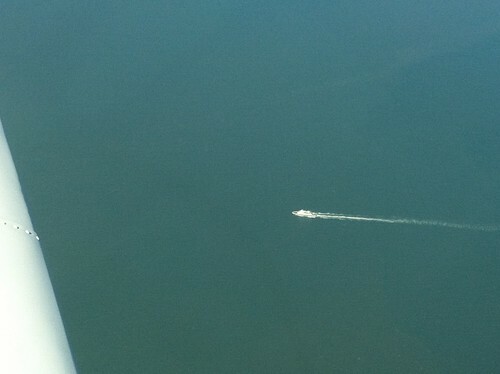 With a slight course correction I'm on my way. This same scenario happened to me one other time and that finally broke me of the vectors to final selection/activate habit. 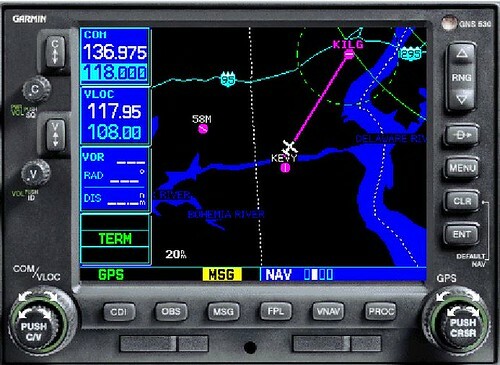 Lets take a closer look with the help of the Garmin 530 trainer. The example flight I punched in is a direct flight to KILG from KEVY. This is a ten minute hop. 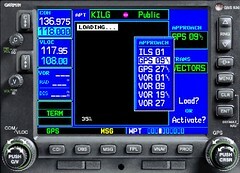 Now lets imagine in IMC the ride is a bit rough and of course you're single pilot IFR. 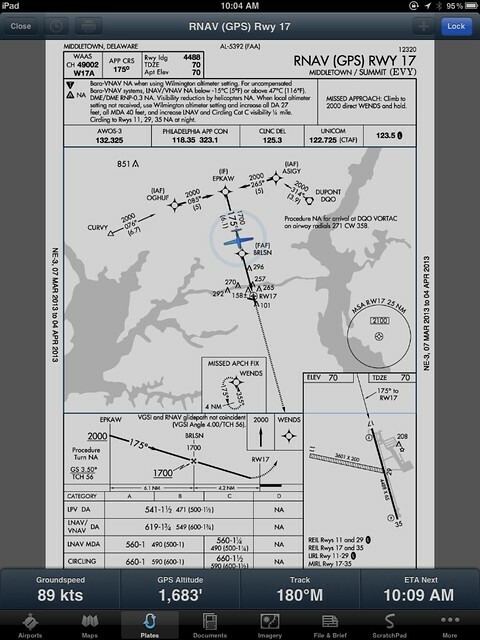 Philly clears you for vectors for the GPS 9 approach. Great, it's just about a straight up and down to final. GUMPS check complete Philly turns you to an intercept angle, everything is looking good. Chatter picks up on the radio and the cloud burst of rain is now pounding on your aircraft. Ughh....thoughts of almost being home briefly enter your head and then you get back to flying. Philly calls and gives you "direct DREFF maintain 2000. If you already loaded the vectors to final, you will have some button pushing to do. Make your initial turn to DREFF, you still have your approach plate handy, right? You can always ask ATC for a vector to DREFF if needed. OK, keep your scan going, there is no auto pilot, you're it. Time to Chug and plug, you select approach, GPS 9 and now scroll through and select DREFF. Adjust your course and you are back to a welcome uneventful flight. A few minutes of stress that could have been averted. After going through this 'approach change' twice I have learned to select the approach and IAF that is the most likely I'll be directed to based on my location to the airport. By doing this you have ALL the choices you will need. If you're getting vectors use that heading bug and fly them, but, have the full approach loaded and ready to select the waypoint and activate. BruceAir,LLC has a excellent write up on this very topic and I suggest checking out his web page for more info. A 50-year resident of Alaska, Jim Rearden has written 17 books and more than 500 magazine articles, mostly about Alaska. He was named Alaska's Historian of the Year in 1999. He lives in Soldotna, Alaska. 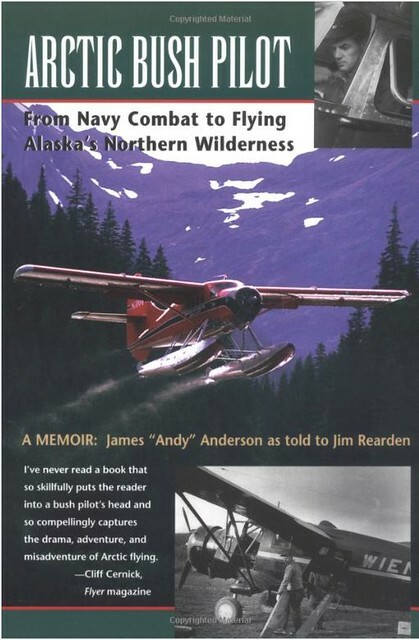 Former Navy combat pilot "Andy" Anderson pioneered post-World War II bush service to Alaska's vast Koyokuk River region serving miners, natives, sportsmen, geologists, and adventurers. Andy and his brother enlisted in the Navy five days following the Pearl Harbor attack. Assigned to the Battleship USS North Carolina he still dreamed of being an aviator. "I requested assignment to the aviation division . Sorry, the personnel officer said. That division is full. What did you do in Civilian life?" "A Water tender and fire man at a coal mine power plant. Fine, he said. You're now in the engineering division of the North Carolina." After a torpedo strike the North Carolina headed to Pearl for repairs. Once at Peal Andy was finally admitted to the aviation division. After six years in the Navy Andy, now a Lieutenant (jg) was headed back to Pennsylvania to his parents farm. This stay was short lived since he had his own way of operating the farm, more modernization and his father had his own, old school by hand. In 1948 he settled in at Bettles village and purchased a Taylorcraft airplane. The Alaska adventure begins. James Anderson flew mining equipment, gold, live wolves and sled dogs, you name it, whatever the people needed he flew it. 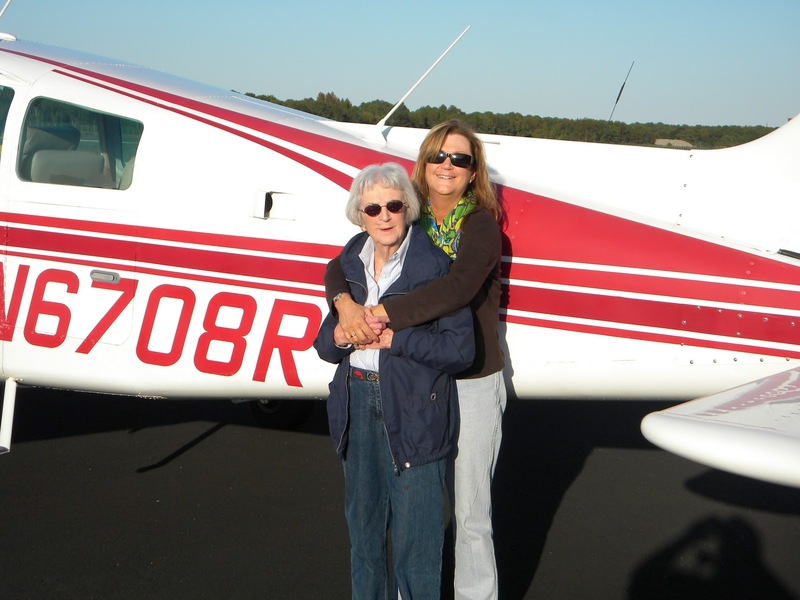 Anderson flew dangerous medical emergency flights when needed and it seemed always in the worst of weather. Make no bones it takes a special breed of human to live that life, in those times, with that equipment. Anderson really bonded with the people and it was more about blending with them and being there for the villagers. I have really enjoyed reading about Alaska and the bush pilots. This book was fun to read and easy to follow, a good pace and always interesting. You can easily feel like your sitting by the fire at the lodge listening to the pilots tell their tales. Andy followed through on his promise to return to the homestead farm in Pennsylvania. Andy's wife did not share his interest in the farm life and decided to remain in Alaska. The children stayed with his wife and the most difficult decision of his life was made, he was headed south in June of 1967. Andy remarried and spent more than thirty years with Betty, his new Bride. "The years since I left Alaska have been good ones. Nevertheless, when I see a small plane high in the sky, or when I think of that magnificent land far to the north, contemplate its clear rivers , remember skyscraping, snow covered peaks, abundant wildlife and the wonderful people I once knew, I feel a longing, a homesickness, for the magic years when I flew as an Arctic bush pilot." James "Andy" Anderson passed in 2007. Mike and I swapped text messages yesterday and agreed to meet at the plane by 8:30. Mike also reminded me that would be 8:30 after the time change to daylight savings time. We were both anxious to fly and do some approach work. After a quick spray with my de-ice fluid 08Romeo was clear of thick frost. Our ramp neighbor had some cleaning to do on his straight tail Cessna, we were ready to start. O8Romeo fired off on the second attempt, she likes prime. I guess we sat for ten minutes or so to make sure the oil temps were up, solid in the yellow. Calm winds today but the tower folks had us taxi to runway one four, not the norm but it works all the same. After our run up we were cleared for takeoff with a right turn on course. First up was Mike doing some flying and maneuvers since it's been a while since he and 08Romeo danced. He didn't miss a beat and always makes it look so easy and smooth. With a transfer of command I was back in the game. I followed some vectors with speed changes (role play radio work) and made my way to KEVY, Summit Airport. 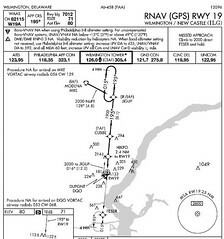 I knocked out the GPS 35 low approach only and then the published missed. From the missed and some vectors I was now shooting the GPS 17 approach which ended in a full stop. I will say it's been a while since I had to come out from under the foggles for a landing and getting the vision quickly up to speed on short final left me "testing" the runway surface for soft spots. Yepper, kerplunked one in, I think I'm a bit shorter now. 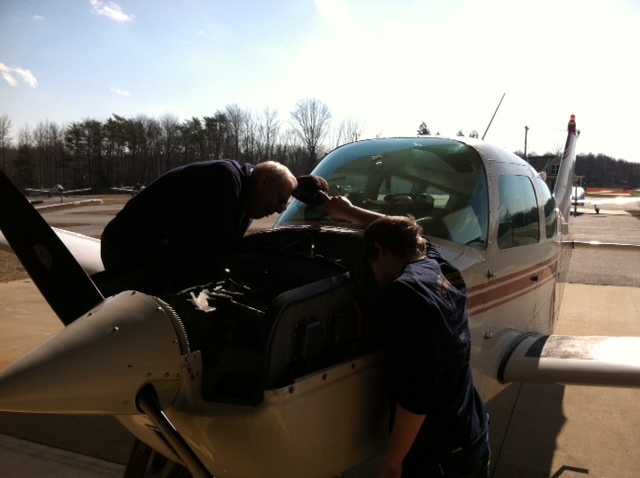 After making some radio changes and plotting out the next round Mike taxied out for take off. Smooth roll and keeping us clear of Mr. turkey buzzard who was head on, opposite direction inbound. Thankfully, 08Romeo was once again in the air. 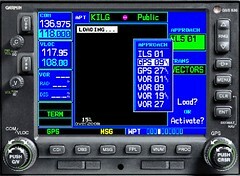 With some vectors I positioned for the GPS 31 into Cecil County, 58M. 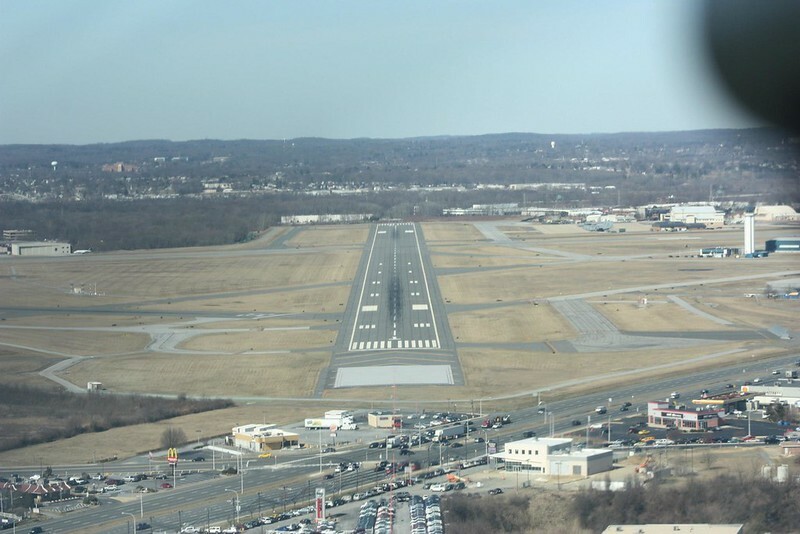 I had shot this approach back in September 2011 to minimums, it was a first for me. Today the only obstacle was the foggles, I really hate them. Yes, hate is a strong word but I'm trying to be PC here. Mike advised no ground contact go missed when appropriate, I do just that. Mike makes some mental notes for review once we are clear of the airport environment. I am to fast on approach, not getting to 08Romeo's "numbers". I need to set it and forget it in order to comfortably stay ahead. Good review and I really appreciate Mike always fine tuning my flight habits. Next we figure roll the dice and see what we get from Philly. 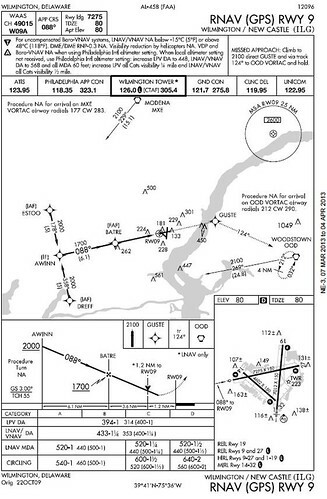 I make my call to Philly and request the GPS 9 approach for Wilmington, advising I am south west of ILG at 2,500. Philly gives me the new code and asks for an ident. Position confirmed, I follow vectors for now and am told to expect direct AWINN. I'm high and need to get to 2000 by AWINN. 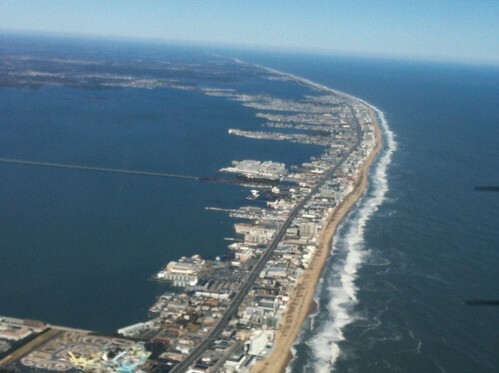 The approach flows smoothly and once handed off to Wilmington I advise inbound. This one is going to end by going missed then back to Philly approach. 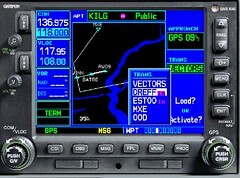 Philly vectors me for the another GPS then ILS 1. I'm feeling pretty good having knocked off some rust now just trying to fine tune. I swap calls with Philly and get handed off to Wilmington, keep it in the donut Gary, follow the needles. I make corrections and do a decent job right until 3/4 mile out. I get about two dots wide as I am at the DH point. 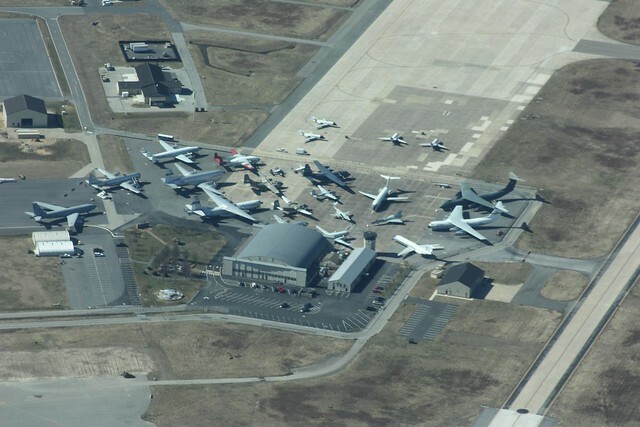 The ILS cone gets tighter and just two dots wide could have you lining up with an adjacent parallel taxiway. Foggles up and ready for landing. I immediately add in approach flaps and make a gentle bank right towards the runway. Adding the second notch of flaps with plenty of runway ahead, I settle 08Romeo down for a good landing. Clear. High of 57F. Winds from the NNW at 10 to 15 mph. 57? I'm flying today! I am scheduled with Mike B on Sunday so I really needed to knock off some rust. Vince was available to fly today so we decided on a flight to the beach. It was good just to play with all the switches and tune the radios, like a little kid with a new toy. 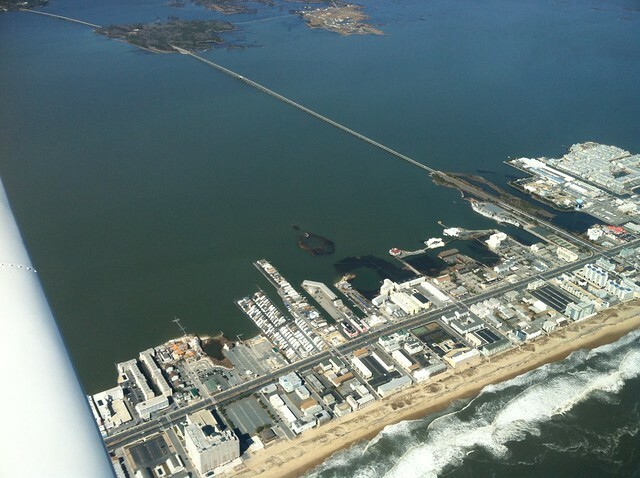 There were a few aircraft coming and going at Ocean City and we managed to work our way in. We had come from across the bay after a quick photo shoot of Bali Hi RV park, my home for the summer. Pretty good winds today but a nice touch and go followed by another round full stop landing. We taxied in to the self serve and took on 20 gallons at $5.50, what a bargain. Bathroom stops and a quick reload, we were off for KMIV, Millville NJ for lunch. The sweet tailwinds were now throwing a blanket over us. I searched every altitude on xm trying to relieve the strain on 08R. Indicated 115, ground speed 85, it's going to be a long ride. 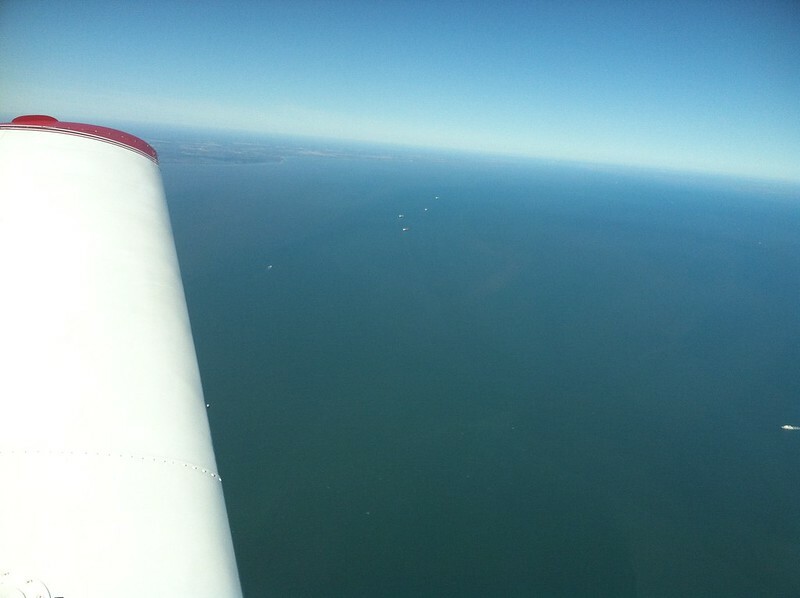 We climbed to 5500 to cross the mouth of the Delaware Bay (10 miles)and enjoyed the view. I did a touch and go into KMIV and added the full stop on the second go. We taxied to the flight line for lunch, making our way in as the crowd was thinning out. With full tummies we pointed 08Romeo to N57, New Garden. I figured I may as well see what it's like landing there since I may be hangared there in the near future. 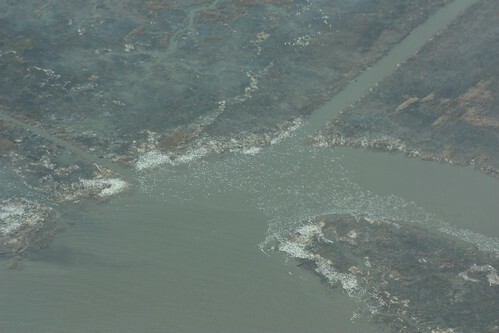 Vince and I had a bumpy ride back across the Delaware but we made our calls and entered the pattern for runway 24. This runway is only 50 feet wide and the markings are shot. I eased 08Romeo in and made a nice landing. The runway is really bumpy with all the crack sealer out there. We taxied off and then joined the conga line to head right back out. It's just a short hop back to Wilmington but a nice ride enjoying the farmland passing below. Vince picked up the current ATIS landing instructions. We entered the left downwind for runway 1, number two to land, looking for opposing traffic, a Falcon jet on the ILS. Traffic in sight, with an extended downwind I make my base turn. I wanted to have some wake turbulence clearance. I landed long which made for a short taxi to my turn off at Kilo. A fun day, as always when flying, with 3.2 in the book. I'm ready for Mike to torture me tomorrow knocking out approaches.